Arunas Chesonis is best known locally as the founder, chairman and CEO of Paetec Holding Corp. 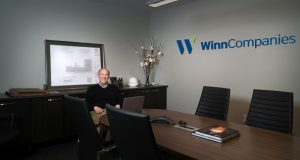 He was one of a small group of entrepreneurs who launched a firm early as the U.S. telecommunications industry took off in the 1990s and was still standing a decade later. In 1997, when Chesonis and fellow Rochester Telephone Corp. alumnus Richard Ottalagana first mapped out plans to start a competitive local exchange carrier, CLECs were hot. Paetec was one of some 300 unregulated telephone companies that sprang up and, for a few years, flourished. After the superheated U.S. telecom market’s bubble burst in 2001, most CLECs went under or were swallowed by larger firms. Paetec survived and continued to grow. When Arkansas-based Windstream Corp. bought Paetec in 2011, in a deal valued at some $850 million, Paetec’s revenues had reached $1.6 billion, up from $23 million in 1999. Serving 20 markets that year, Paetec was a national carrier. Chesonis got into the telecom business as a recent Massachusetts Institute of Technology graduate. He started his first telecom job with Rochester Tel in 1984, and he had developed a national reputation as a telecom whiz kid by the time he started Paetec in 1998. After some three years at Rochester Tel, Chesonis moved to the locally based long-distance company ACC Corp., where he served as president and chief operating officer until 1998, when AT&T Corp. bought ACC. A 2007 merger with North Carolina-based US LEC Corp. enabled Paetec to fill out its southeastern U.S. network and assume US LEC’s status as a public company. US LEC co-founder and former CEO Tansukh Ganatra was Chesonis’ first boss at Rochester Tel and later supervised Chesonis at ACC. He joined Paetec’s board after the merger. After acquiring US LEC, Paetec acquired McLeod USA Inc., an Iowa-based CLEC that had gone through two Chapter 11 bankruptcies. The $440 million acquisition filled in Paetec’s eastern and western U.S. networks, for the first time giving it a national footprint. In its last merger before being acquired by Windstream, Paetec acquired Virginia-based Cavalier Telephone Corp. in 2010. The deal included Cavalier’s 16,600 route-mile fiber-optic network. Windstream CEO Jeffery Gardner cited the fiber assets that Paetec acquired in the McLeod and Cavalier acquisitions as features that made a takeover of Paetec attractive to Windstream. Chesonis, who once said that he hoped to retire early and teach, moved into a new entrepreneurial venture, joining Sweetwater Energy Inc. as CEO. The company is a renewable bioproducts producer in Rochester. He also has invested in an array of other firms locally and beyond.